Bates Family Blog: Bates Updates and Pictures | Gil and Kelly | 19 Kids | Bringing Up Bates | UP TV: It's a Boy! Aww! Yay! So excited for them. :) My mom is due with #9 just 2 weeks after Erin is due. I'm happy for you guys!!!! A boy!! That's great! Chad and Erin you are both nice and pray that all goes well with baby. Congratulations you two. But may I ask why Chad and Erin decided to wait this long to announce their gender to the world. Was it because they didn't want to tell too soon just in case of another miscarriage. Now I know where the blog header photo comes from. I really thought that they were having a girl! I don't know why. I guess because Erin is so girly. I thought for sure that the baby was going to be a girl. I like the name that they chose a lot. It is cool that this is the fourth generation it is being used for. Chad is Charles Stephen Paine III. Chad and Erin like the name Carson, so they have already decided to make that their baby's nickname. why not name him Carson...its such a long stretch away from his actual name? I am so happy for them! They are going to be awesome parents and that little boy is going to be so loved. Just so happy for them! I am soo excited for Erin and Chad!! They will be awesome parents. Congratulations guys and to God be all the glory! In case folks are interested UPtv has signed up the Bates for Season 2. The 1st season will end soon but season 2 starts in June. Both Alyssa and Erin will have their babies in season 2. Just found out. UPtv has had a resounding interest from viewers for more of the Bates! Yay!!! CONGRATULATIONS! Babies are a precious gift from God! CARSON is a little miracle. i love how erin included her cousin katherine in the surprise. her face was adorable when she opened the envelope. how special that chad & erin chose thanksgiving to announce the gender with all the family present. very happy for them! They keep saying watch to night to see...I live in Ontario and never get to see this show..loved it when we did get it...What are are chances of getting to watch these? Yes please keep us posted. God bless you all. He is so cute I love that he is going to be name after his daddy SO EXCITED!!!! congratulations! im so excited for you. i hope everything goes good. It's amazing how clear these pictures are! I guess Tennessee is ahead of Michigan in the clarity of ultrasounds. 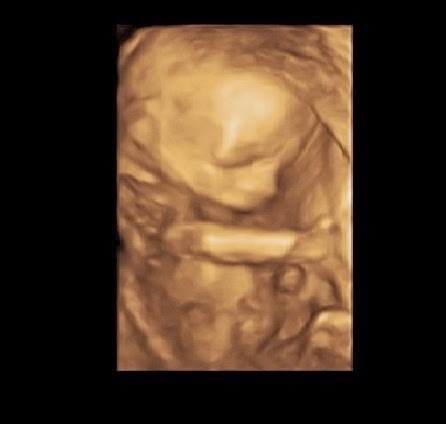 The average mom doesn't get a 3-D ultrasound. Yes, maybe it's because of her high-risk pregnancy. I'm just basically saying she is blessed to have one. Most insurance companies I know will not pay for those, not even a portion, so if a mom wants one she has to pay the full price, which is very expensive. Well, the Paines are making money with the show, so I'm sure the extra money helps. I saw a high-risk pregnancy specialist (perinatalogist) during one of my pregnancies and a 4D ultrasound was a routine part of my appointment and yes my insurance paid for it. These types of ultrasounds are becoming more common. 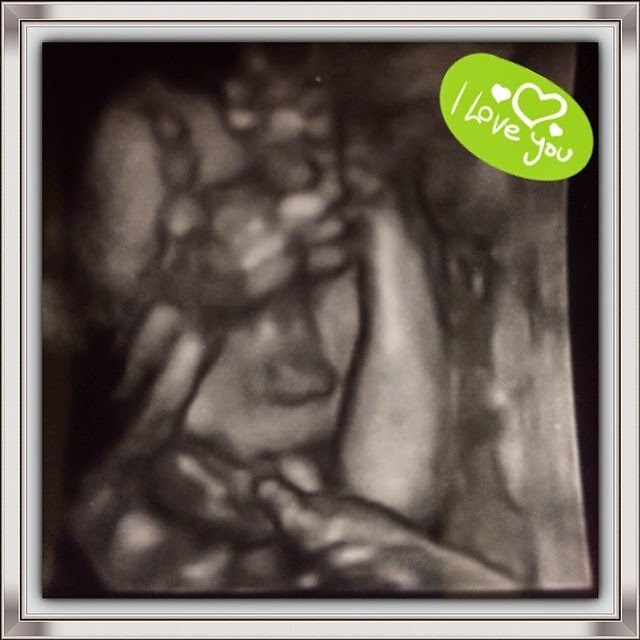 I personally liked the traditional ultrasound images better but the 4D type can be used for medical purposes. It's an advancement in medical technology. Erin's pregnancy is high-risk so I'm sure he's doctor considers it a necessity. That's great that you had that option, and that your insurance paid for it! So far my daughters have not had that option with their pregnancies, even the one within the last year. Maybe someday in Michigan it will be an option that insurance will pay for. Carson is a very cute name! Praise the Lord! God bless Carson. Yeah. I will try that. Can you tell me what days, times, and channel I can watch the show? So excited!!! Carson is a great modern nick name:) praise God for this little blessing!! Such wonderful news. So happy everything is progressimg normally! All my life I never saw ultra sound pictures used life photographs, I am over 55, and maybe a bit old fashioned but I don't actually like to see this, it makes me feel squeamish. I think they should call this baby Stephen, and their next son Carson. Just my thoughts. Did the name Carson have anything to do with Carson-Newman university? I've heard Erin's parents went there in the past. Actually Carson is named after the college Carson-Newman, in which Erin instead of Chad had named him first.